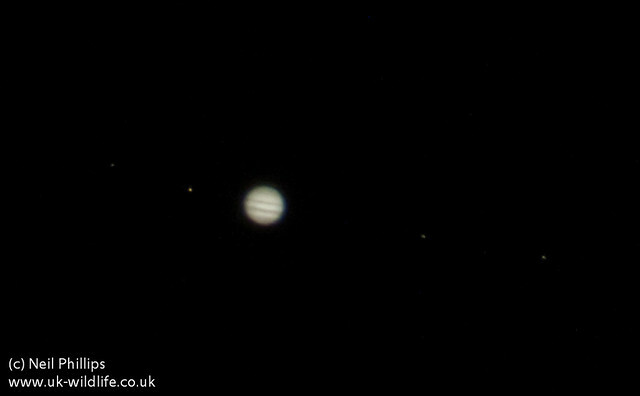 Last month I walked out my front door and noticed Jupiter shining bright in the sky. I had my camera bag nearby so I got out my tripod and tried taking a few shots with my K-5 DSLR and 300mm lens. You can see a pixelated Jupiter and the 4 dots of the moons. I then tried the Pentax Q, mounted on the 300mm to give me 1600mm equivalent. Now I could make out the bands across Jupiter and the moons. Finally I added the 1.7x Teleconvertor to the Q set up to give the equivalent of more than 2000mm and managed this shot, which I was pretty pleased with for my first stab at astrophotography.